No Baggage is a memoir that will resonate with adventurers and homebodies alike-it's at once a romance, a travelogue, and a bright modern take on the age-old questions: How do you find the courage to explore beyond your comfort zone? Can you love someone without the need for commitment or any expectations for the future? When Clara Bensen arranged to meet Jeff Wilson on the steps of the Texas State Capitol, after just a few email exchanges on OKCupid, it felt like something big was going to happen. Clara, a sensitive and reclusive personality, is immediately drawn to Jeff's freewheeling, push-the-envelope nature. Within a few days of knowing one another, they embark on a twenty-one-day travel adventure from Istanbul to London-with zero luggage, zero reservations, and zero plans. They want to test a simple question: what happens when you welcome the unknown instead of attempting to control it? Donning a single green dress and a small purse with her toothbrush and credit card, Clara travels through eight countries in three weeks. 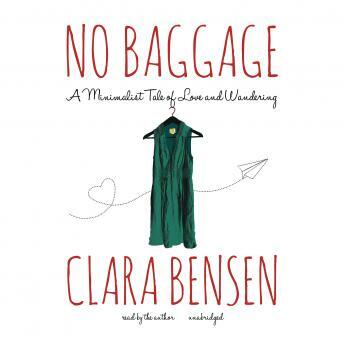 Along the way, Clara ruminates on the challenges of traveling unencumbered, while realizing when it comes to falling in love, you can never really leave your baggage behind. I found myself zoning out a few times while listening, but for the most part I really enjoyed the story. I could definitely relate to the character: I love traveling but struggle with doing so without a strict plan. I feel inspired to tweak my next trip and love more minimally.